Orbital plane change is a challenging propulsion space maneuver. It requires a large expenditure of energy to achieve a small change in the orbital plane. A propulsive plane change is an impulse turn, and is executed with the thrust line perpendicular to the orbital path and in the direction of the plane change. The equation for the incremental velocity for an impulse turn is given in equation (5.11) for a non-rotating Earth. As indicated by equation (5.11), the higher the orbital altitude the less the incremental velocity for a given plane change. To travel to that higher orbital altitude requires propellant, as we have just seen in the previous section. So there is an opportunity for a trade-off as to whether the change in orbital altitude propellant plus the reduced plane change propellant is less than the lower altitude plane change. From equation (5.11), the incremental velocity per 1-degree change in orbital plane is about 446ft/s (135.9m/s) at an orbital altitude of 100 nautical miles. So a 5-degree plane change requires an incremental velocity of 2,230 ft/s (679.7 m/s). The right sketch in Figure 5.11 depicts an orbital plane change in LEO, and a higher-altitude elliptical orbit to execute the plane change at a higher orbit. To accomplish this a rocket burn is required to put the spacecraft into the elliptical orbit, then at apoapsis a rocket burn to rotate the orbital plane, and finally a final rocket burn to return the spacecraft to the lower-altitude circular orbital speed. As we shall see, there is an angle above which this procedure requires less incremental velocity than a lower orbital altitude plane change. Figure 5.11. 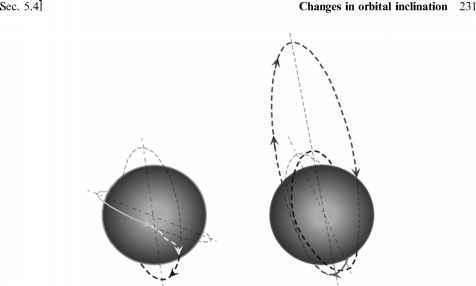 Orbital plane change via an aerodynamic turn in the upper atmosphere (left) and an impulse turn executed during an elliptical transfer orbit to 22,400 nautical mile orbit. The left sketch in Figure 5.11 depicts an orbital plane change in LEO performed by entering the Earth's upper atmosphere with a high lift-to-drag ratio hypersonic glider and executing a thrust-equals-drag aerodynamic turn at maximum L/D. 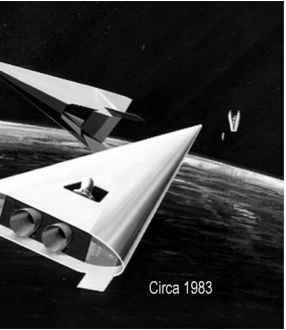 This maneuver requires a hypersonic glider, but it enables a much larger orbital plane change for the same propellant consumed. With conventional rocket propulsion, this method of changing the orbital plane is always a lesser energy approach. This was first analyzed and presented by Dr Wilbur Hankey in 1959 when at the Air Force Flight Dynamics Laboratory at Wright-Patterson Air Force Base, Ohio, now with Wright State University in Dayton, Ohio.